Creative detail enhancement with no halos or artifacts. Is there a better alternative to Topaz Detail? Is Topaz Detail really the best app in Image Editing category? Will Topaz Detail work good on macOS 10.13.4? Topaz Detail puts unique detailing capabilities right at your fingertips. Built with one-of-a-kind technology, this plug-in is invaluable for photographers who want precise and intricate detailing abilities that will help achieve high-quality enhancements. Detail breaks down an image into three levels of internal detail separation and three levels of tone separation. What makes it stand apart from other similar tools is the flexibility and control that allows you to selectively enhance or remove detail throughout your image without the side effects of halos or artifacts. Note: Although Finder indicates that this has no version number, the developer refers to it as version 3.1.0. 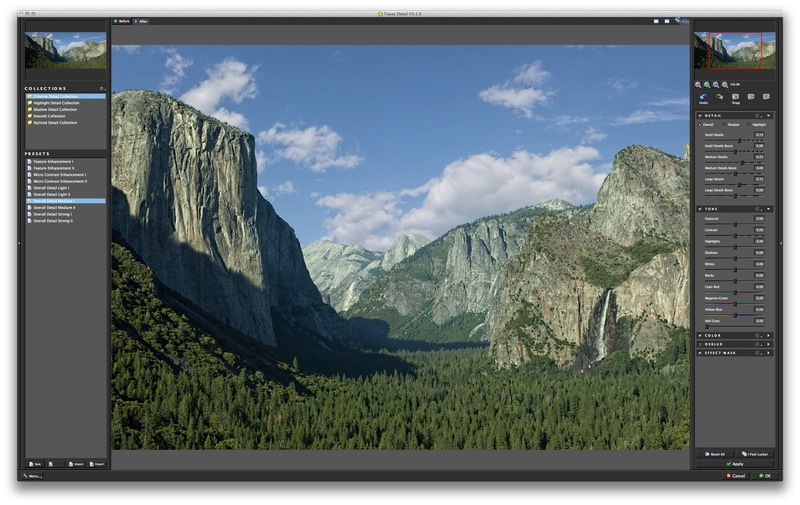 Enhanced color adjustments using ProPhoto RGB color profile internally in the processing engine. Added a feature to allow users to quickly enable/disable a particular paramter group. Topaz Detail needs a review. Be the first to review this app and get the discussion started! Get unprecedented control over every step of the detail enhancement process. Topaz Detail allows you to find the perfect balance of detail in your images by giving you a unique command over small, medium, and large image details in 3 separate tonal regions: Overall, Shadow and Highlight. Take your images to the next level by taking advantage of the most advanced detail enhancement technology currently available. Apply crisp and clean image sharpening without fear of "oversharpening". A major issue with all other sharpening techniques is that they create sharpening artifacts known as "overshooting" or "halos". Topaz Detail uses the most recent advances in micro-contrast imaging technology to almost eliminate these sharpening artifacts, allowing for highly effective and natural sharpening. Adding even more control over image detail are the multiple tools that allow for selective addition or removal of detail exactly where it's needed. With the edge-aware masking brush, transparency options and the ability to stack effects using the Apply button, adding precise and intricate detail is easier than ever. Added group presets, which allows users to quickly apply a commonly used parameter settings for a particular parameter group. In the Effect Mask, A, B, and Erase brushes are added for accessing commonly used brush settings. The A/B brush provides a convenient way to remember the last used brush settings.